Google has completely remodeled its Newsstand application to compete with Apple News and Flipboard. Now it will be more tailored to the users’ interests to create personalized experience. Each story now appears with a footer which shows that why the specific news or article is appearing in the person’s feed. Google Newsstand is the digital news aggregator application which was first launched in November 2013 and it is available for Android and iOS. It allows the users to read and subscribe to the articles and magazines of their choice. It also gives option to the users to bookmark the articles for later reading. The app has more than 100 million monthly active users. For easier navigation, Newsstand now has four main tabs. The main “For You” tab brings you the personalized news and articles with an explanation about why a particular story is appearing in your feed. “Library” tab will contain the sites of your choice, “Explore” tab will suggest further stories to look and “Read Later” tab will contain the bookmarked articles and stories. The news categories which used to appear on home page have been shifted to library, as per new update. The overall appearance has also been modified. Now, more of the focus is on photos and auto-play videos instead of the material. “Every story and topic in Newsstand now comes to life in a more engaging, beautiful presentation,” Google Play Newsstand head of product and engineering Sami Shalabi wrote in a blog post. Despite all the incredible changes, there’s still a pitfall. With everything personalized appearing in the feed, people may miss the important news because the important news and what users want to read, may not always coincide. Google has also introduced Newsstand web-app which will have all the features of the application on your computer screen. 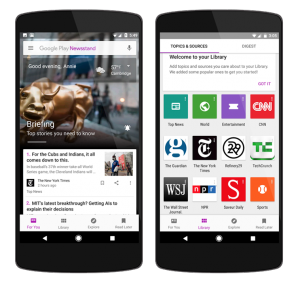 The post Google Newsstand relaunched with a new interface and web version appeared first on TechJuice.